Florida Senate Race Narrows; Trump Spreads Fraud Claim Without Evidence Voters should be worried about "rampant voter fraud in Palm Beach and Broward counties," said Senate candidate and Florida Gov. Rick Scott. Experts say previous claims of widespread fraud are false. President Trump speaks to reporters at the White House on Friday. The president has joined Florida Gov. Rick Scott in amplifying claims of voter fraud in the state's Senate race despite lack of evidence. Days after midterm voting, as ballots are still being counted, Republican lawmakers who are holding on to tight leads in midterm states are alleging foul play and voter fraud. The claims were amplified by President Trump, without evidence, on Friday morning. "You mean they are just now finding votes in Florida and Georgia — but the Election was on Tuesday?" he wrote in a tweet. "Let's blame the Russians and demand an immediate apology from President Putin!" Current Florida Gov. Rick Scott, locked in a tight Senate race, said in a news conference Thursday night that "the people of Florida deserve fairness and transparency and the supervisors are failing to give it to us." "Every Floridian should be concerned there may be rampant voter fraud in Palm Beach and Broward counties," he said. "I will not sit idly by while unethical liberals try to steal this election from the great people of Florida." Scott's race against Democratic incumbent Sen. Bill Nelson seems to be headed toward triggering a mandatory recount. Florida law says any race within a 0.5 percent margin must go to a recount, and as of 9 a.m. Friday, Nelson trailed Scott by 0.18 percent. Meanwhile, A Florida circuit court judge has ordered Broward County Elections Supervisor Brenda Snipes to provide records on the total number of ballots cast, the number counted and uncounted, and data on vote by mail for the county by 7 p.m. ET tonight, siding with Scott. At an emergency hearing on Friday, Snipes' attorneys suggested this could slow counting. GOP Rep. Matt Gaetz said to reporters outside the courtroom "We're here to get her records to show that there is fraud or there isn't fraud." Scott has asked state law enforcement to investigate the elections offices of Palm Beach and Broward Counties for wrongdoing, without evidence of what should be investigated. The Florida Department of Law Enforcement has said they are not investigating, that no allegations of fraud have been brought forward and there has been no written request from Scott yet. Nelson released a videotaped statement Friday afternoon accusing Scott of abusing his office to undermine democracy and "stop a complete and accurate counting of all the votes in Florida." Previous claims of widespread voter fraud, including Trump's claim that millions of people voted illegally in 2016, are considered false by voting experts. One investigation, published in 2014, found 31 possible cases of in-person voter fraud out of more than 1 billion ballots cast over a 14-year period. Scott claimed victory Tuesday night and has filed lawsuits against two county election officials, in Palm Beach and Broward counties, alleging their offices have withheld voting records. Trump echoed Scott's claims Thursday night, tweeting that "Law Enforcement" would look into election fraud in Florida. Nelson's election attorney, Marc Elias, tweeted Friday that "as the counties continue their work, I expect that margin will narrow further. And then the State will conduct an orderly recount." Trump has a history of calling out fraud, without providing evidence to back up his claims. No widespread claim of voter fraud by the president has ever been proved true. He even created a commission to investigate alleged fraud after the 2016 election, but it dissolved without releasing any findings. 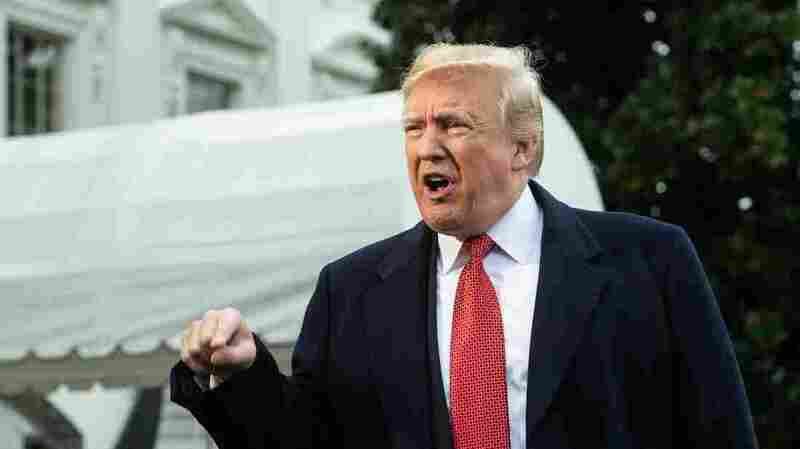 "They're finding votes out of nowhere, and Rick Scott who won by — it was close, but he won by a comfortable margin, he easily won but every hour it seems to be going down," Trump said outside the White House Friday. "I think that people have to look at it very, very cautiously." In the case of Florida still counting ballots more than 48 hours after polls closed, David Becker, the executive director for the Center for Election Innovation and Research, told NPR it is extremely common for a voting jurisdiction to be taking as long as Broward County is. "Election officials are literally just counting the ballots. This isn't corruption or fraud," Becker said. "It is literally the best of democracy. Let election officials do their job and count the ballots." Georgia: Republican Kemp claims Abrams trying to "create new votes"
In Georgia, gubernatorial candidate Stacey Abrams is hoping to force a runoff with her Republican opponent, Brian Kemp, who resigned his post as the state's secretary of state on Thursday. Kemp has already claimed victory, and his campaign released a statement saying Abrams was trying to "steal" the election in a courtroom. "Abrams campaign is trying to create new votes, because they know it's their only remaining hope," said Ryan Mahoney, the Kemp campaign's communications director, in the statement. But Abrams' campaign maintains it just wants all provisional and absentee ballots to be counted before she decides to concede. The Associated Press has not called the race, and votes have continued to be counted this week. Kemp holds about a 63,000-vote lead, with 50.3 percent of almost 4 million votes. He needs to finish above 50 percent to avoid a runoff election. Lauren Groh-Wargo, Abrams' campaign manager, wrote on Twitter that if Kemp "cared about Georgians and being a legitimate [governor], he would wait until results are certified." Abrams' campaign has questioned a number of aspects of the state's election administration, which Kemp oversaw until Thursday, including the fact that hundreds of votes came in from absentee ballots in Cobb County, according to the AP, after Kemp's office said all absentee ballots had already been counted. "He is making a joke of our elections system and stepping on basic rights," Groh-Wargo said. "This is despicable." She noted that many jurisdictions across the country are still tabulating results as well. Overnight Thursday for instance, the lead swapped in the Senate race in Arizona, with Democratic nominee Kyrsten Sinema pulling slightly ahead of Republican Martha McSally. Gillum already conceded the race on Tuesday night, but he tweeted Thursday night after Scott announced his lawsuits against the two elections supervisors. "Counting votes isn't partisan — it's democracy," he said.